Friday Wrap-Up – News from Picaroons, Petit-Sault, Gahan House, Rockbottom, Shiretown, Hell Bay, Propeller and more! Good morning! As August comes to an end and the long weekend begins, beer news in our region has slowed down… but only slightly. Let’s get right into what’s going on in our region! • Picaroons is releasing a new beer next week, their first Double IPA! Selection Double IPA is brewed with no less than seven hop varieties: Pride of Ringwood, Bramling Cross, Cascade, Orbit, Galaxy, Sorachi Ace, and Slovenian. Coming in at around 80 IBUs and 7.9% ABV, this new beer will be released next Thursday, Sept. 4th for growler fills only, at the Brewtique when it opens. It will also be a part of the ANBL pilot program for growler fills; no word yet if this will be at all three ANBL stores participating in the program, or just the Prospect Street location. • Distribution for Brasseurs du Petit-Sault is expanding, as one of their two inaugural beers, Tante Blanche (a Witbier) is now available at ANBL stores in Fredericton (York St. location), Dieppe (Régis St.), and Moncton (Vaughn Harvey Blvd.). Also, their Belgian Blonde, Bob LeBoeuf, should be following at the same locations sometime next week. Look for both beers to continue to make their way across the province; we’ll be sure to keep you updated as to their availability. • Speaking of Petit-Sault, they’re currently hiring for the position of Sales and Marketing Rep. Are you in good physical shape, bilingual (a must for the position), and want to hang out with a very friendly staff (we can attest to this)? Well, now’s your chance! The position includes ordering, promotional events, ongoing relationships with bars/restaurants and ANBL stores, making deliveries, rotating inventory, etc. If you’re interested, send your resume to them via email, no later than September 5th. More info on the position is available here. • And while on the topic of job-hunting, Garrison is also looking to fill some part-time positions at their retail store and promotional events in Halifax. If you’re hard-working and enthusiastic (read: love craft beer), send a resume via email to Jeff Green ASAP. • With the grand opening of the new Gahan House location on the Halifax waterfront approaching, the Ladies Beer League is holding a special sneak peek on Monday, Sept. 8th from 7:00 – 9:00 pm. During this time, ticket-holders will be given a “Beer 101” and introduction to Gahan’s expansion to Halifax. They will then be led through a guided tasting of 10 different Gahan/PEI Brewing Co. beers by brewmaster Karen Allen. Tours of the new brewery will also be offered, and attendees are encouraged to stick around after to order food and more beer. The beer will be a combination of unique offerings brewed onsite by Allen, as well as those in the PEI Brewing lineup. Only 30 spots were available, and they sold out within 24 hours (sorry)! We understand this is just the beginning of an enduring relationship between the Ladies Beer League and Gahan, and we can look forward to a beer dinner this winter, as well as other exciting events from the LBL this fall. Keep an eye on their Events page for more details. • Shiretown has another beer hitting shelves at the ANBL this week. Big Brown Ale has been available on tap at certain bars/restaurants across the province, and on tap for growler fills at the brewery, and is now joining Blonde du Quai and Siren’s T’Ale in 500 ml bottles. As usual, it should be hitting stores in the Charlo area first, but will spread to other outlets in the very near future. • Rockbottom Brewpub in Halifax is releasing their latest new beer today, Rhubarb π. This beer weighs in at 4.6% and very low IBUs (from East Kent Golding), but the highlight here is the sour character imparted by the choice of Lactobacillus bacteria as the fermenting workhorse, which produces lactic acid for an acidic and tart flavour, hence the rhubarb name. Grab a pint of it at the ‘bottom today! This is the second lacto sour done by brewer Greg Nash, the first being last year’s Synaptic Illusion. • Hell Bay Brewing has sent the final few kegs of their new India Brown Ale to Bar Stillwell for the city folks to enjoy (the rest was sold to thirsty locals in the Liverpool region). The beer is sweet and malty upfront, and leads to hints of rum and molasses with a dry finish, and weighs in at 6.5% and 45 IBUs. Brewer Mark Baillie tells us that the next version of the R.I.P.(A.) will be out soon, and will make its debut in bottles for the first time (will also be available in kegs and growlers, as were previous versions). We’ll have more recipe details closer to the release. • It’s Hop Harvest Time in our region! While several breweries in the Atlantic Provinces will be brewing up Wet Hop beers in the next couple of weeks, we believe the first to do so was Big Spruce in Nyanza. With help from some volunteers, they picked their own farm-grown Magnum, Cascade and Mt Hood hops, and brewed up Hoppily Remarried earlier this week. While the IBUs are not available, they used enough hops to get them into Imperial IPA range, with an expected ABV of 8.4%. Look for this beer at the brewery and select tap accounts in September. • Propeller Brewing has released another One-Hit Wonder, the Cluster Bomb IPA. It weighs in at 7.1% ABV and 64 IBUs, thanks to a ton of Cluster hop in the brew. And what a great Lambic launch event at Stillwell last week! The Framboise Lambic was a big hit, and after selling out at Stillwell, the beer sold like hotcakes on Monday at both the Halifax and Dartmouth locations. Look for the other beer in the Lambic series in the coming months, including a blackberry, cherry, and non-fruited version. • This weekend, the fifth annual Oktoberfest des Acadiens is being held in the village of Bertrand, NB. Starting yesterday and continuing through to Sunday, activities include Bavarian music and dancing, live entertainment, games, and of course, beer! There will be several beer tastings throughout the weekend, including two by Acadie-Broue owner/brewer Patrice Godin (these were by reservation only). Tickets and passes are still available online through their website. • Our contest to win two tickets to the PEI Beer Festival next weekend has come to an end, and the winner is… Derek Stapleton! Congratulations, Derek! Contact us as soon as possible and let us know which of the three sessions you’d prefer to attend, and we’ll hook you up with the tickets. Since our post last week, they have announced After-Parties for both Friday and Saturday nights. Drop by Fishbones Oyster Bar for more food, drink, and music (Friday: In-Flight Safety + Coyote, Saturday: The North Lakes + Wildcat). Entry is $8 with your Beer Fest mug, $10 without. More details here. This year’s Prince Edward Island Beer Festival, produced by the PEI Brewing Co., will be held on Friday and Saturday, Sept. 5th and 6th. We recently chatted with Alex Douglas, Director of Branding and Community Engagement with the PEI Brewing Co., to find out a few more details on the festival. This is the first year that the festival will be held indoors, at the Delta Prince Edward Hotel. According to Douglas, this was a natural decision due to the unpredictability of weather and consequent protection from the elements. Also, the new ballroom where the festival will be held has a patio overlooking Peakes Quay, which should provide an enjoyable atmosphere for festival attendees. There will be three tasting sessions over the weekend; two evening sessions, Friday and Saturday, from 6:30 – 9:30 pm, and a slightly shorter afternoon session on Saturday from 2:00 – 4:30 pm. Evening tickets are $40 (+tax and fee), and the afternoon tickets are $30 (+tax and fee). 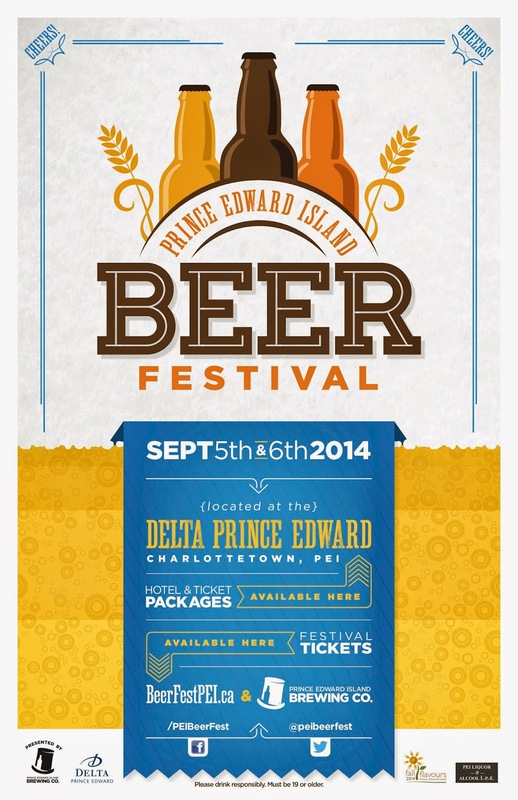 Tickets are still available; they can be purchased online, or in-person at the PEI Brewing Co. There are also discounted hotel & ticket packages available through the Delta; call to inquire (1-877-450-7752). We’ve been assured that Designated Driver tickets will also become available soon, for $15 online. In regards to the Cask Contest, attending breweries have been invited to create a cask beer for the festival; festival goers will have the chance to try all cask offerings and vote on their favorite of the festival. Participating breweries in the contest will include PEI Brewing Co., Garrison, Picaroons, and possibly more. As for the games, we don’t have full details as to what they will entail, but Douglas said to expect “some classic East Coast-style party games to be played”. There will be food available for purchase from several vendors at the festival. No word as to which vendors will be participating yet, however, details should follow on the festival’s website and social media links soon. As for the beer, the mostly-completed brewery and beer list has been released on the festival’s website. Atlantic Canadian breweries attending include PEI Brewing Co., Garrison, Picaroons, and Pump House. Like last year, there will be over 75 different beers pouring, so attendees should have plenty to choose from. Starting tonight, we’ll be holding a contest to give away two tickets to the festival; any session, winner’s choice! It’s easy to enter… take a picture of any of the beers that will be at the festival, and Tweet it or share it to our Facebook page, with the hashtag #PEIBeerFest. Only one entry per person; the contest will begin immediately and continue until next Thursday, August 28th at 11:59 pm. That gives you a whole week, so don’t miss out on your chance to win! And remember, stay tuned to the festival’s Facebook page and Twitter account for more updates on food, entertainment, and beer over the next couple of weeks!